Wudang Mountains in China were at one time a sort of University for Martial Arts. Masters of different disciplines would come together and exchange their research findings in order to advance their combined understanding. There the principles of how to use the human body and mind most efficiently for self-defense were distilled into a new Martial Art. It was named Ba Gua Zhang, or Eight Trigram Palm, after the set of Daoist mathematical principles that were used to describe it. This was a giant leap forward. A Martial Art was no longer a set of techniques useful in a particular situation but an understanding of how to fully develop the body and mind so that it could respond most effectively in any combat situation. A very useful byproduct of such development was the attainment of the full potential of one’s body and mind. Several hundred years ago, a Ba Gua Zhang Master ‎Dong Haichuan made the art famous by becoming the lead instructor at the Chinese Emperial Palace Martial Arts school. It then became the art of choice for professional bodyguards. It was also an art that was taught to the Emperor’s family, not only for its self-defense proficiency but for the health benefits that it produced. My school is directly descended from Dong Haichuan’s Emperial school. 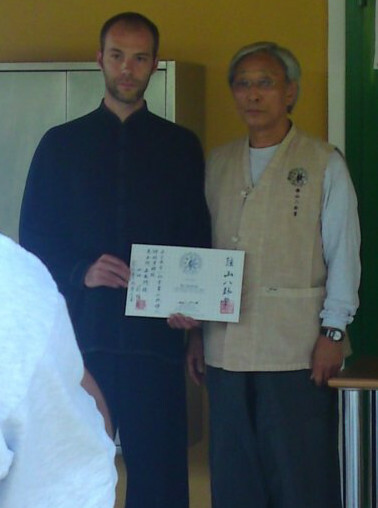 My Sifu, Park Bok Nam, is a Sixth Generation Master. Today he is the world authority on this art. While most Ba Gua schools attempt to preserve the forms and techniques handed down to them, our school continues to develop the art following the scientific principles that define it. Sifu Park Bok Nam has been fully dedicated to the art for over 50 years and has taught hundreds of students. His Sifu was Lu Shui Tien, a Fifth Generation Master whose skill is now legendary. Sifu Lu spent his life dedicated to the Chinese Martial Arts and we are very fortunate to be able to benefit from his experience.